Curiyo is a free addon for Chrome, Firefox, Safari and Internet Explorer to make search easier. One long click on any word in the page, and it automatically looks for the clicked word on Google, Youtube, Wikipedia, Google News, Wordnik etc., and combines the information. It presents the information in a pop window within the page. It can also shows images related to the search and shows the information in tabs which makes it easier to use. It also has a tab for Google Translator. This addon is different in the way it searches for the information on the web. It fetches the information from your favorite websites where we would usually go in search of information. 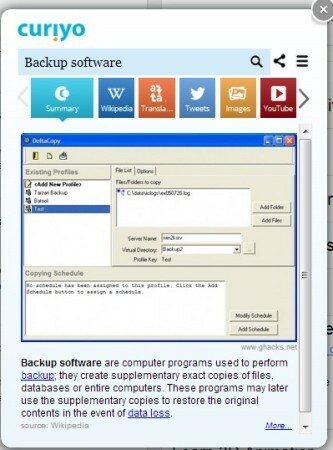 It pops up within the same page we are on and presents the information in tabs. The first tabs itself gives you enough information that it’s sufficient for you to decide if you really want to go for other tabs and learn more about what you searched for. It could be anything you’re searching for, maybe it’s a mythical animal or a mysterious place you just read about. All you have to do is just “one long click” on the word and there it is. Well, it is one of the best addon for Chrome that I ever used before. Of course it does arrange the information in tabs and we have talked about that already. But something else that caught my attention was that it underlines the terms that it thinks is important for you. Sometimes, while reading you skip some terms you don’t know about because you don’t want to open another tab or window to search for that term. Curiyo underlines the words and all you have to do is to click on that and Curiyo pops up with the information. Your friend from the other part of the world just posted a comment on your picture to tell you how good you look but you don’t understand a word he/she said. Or maybe it’s a website in another language that you don’t understand. Google’s Translator comes to rescue but you don’t have to open another tab with Google Translator. It is all in there in Curiyo. All you need to do is to select the language and type in the text. If you want to get information from another website that’s in the list, all you need to do is to click on the “Left” or “Right” arrow button and there you go. You will get a variety of informational sites like, Wikipedia, Google News, Google Maps, Wordnik etc., with videos from Youtube and images related to the topic you searched for. Installation is pretty simple. You don’t even have to worry about browser compatibility and going to the web store to search and download the extension. You just have to visit their website and click on the “Get it now” button and Curiyo will automatically detect the browser type for you and install it into your browser. Because Curiyo is available as an addon for Chrome, Firefox, Safari and Internet Explorer, you don’t even have to worry about searching for an alternative search tool that would be equally as good as Curiyo is. What if you want to share it? You found something interesting on Curiyo and you want to share it. 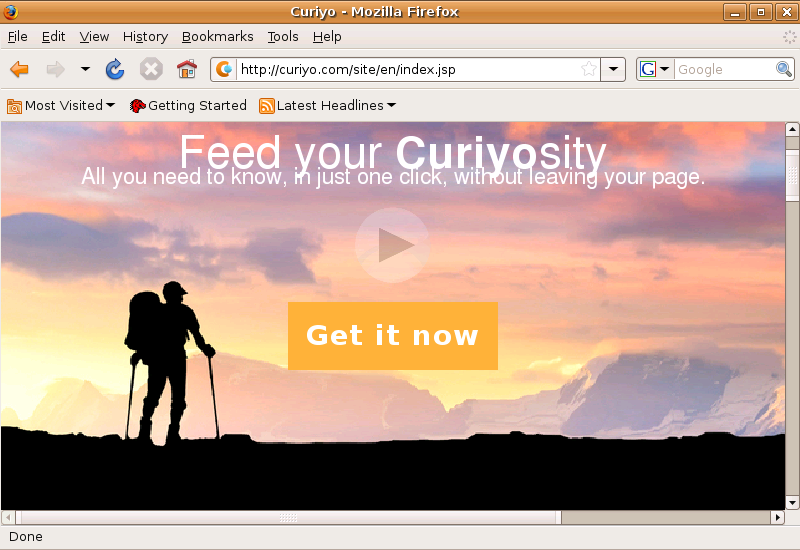 It simple, just click on the “Share” button on the top right hand corner of the Curiyo pop up window and share it. Curiyo just doesn’t confine you from searching for information by just clicking on the word. You can also click on the Curiyo icon next to the address bar and it will give you a pop up window, ready to search for something new for you. You can of course turn off the underline feature if you don’t want Curiyo to bother you with those lines under the text. Curiyo is a simple and good addon for Chrome, Firefox, Safari and Internet Explorer and is truly Cross-Platform. Whether you’re using Windows, Linux or Mac, you can use this wonderful addon to make your search a hundred times easier. You can say goodbye to a hundred tabs open (not literally; maybe some multiple of 10). Information is brought to you from trusted and reliable source so you don’t have to open links to confirm if that’s what you’re actually looking for and legitimate or some worked up SEO magic that brought those irrelevant pages to Google’s Search Result page.